mama elephant | design blog: Mama Elephant December Stampede! Hey everyone! Welcome to Mama Elephant's December Stampede! You got the first taste of our stampede on our launch day (Day 1 and Day 2) and we're back to do it again! Basically, it's a blog hoppin' blitz where we stampede through our designers' blogs as they showcase our November release stamps again! Joining us once more are our super wonderful guests - Lexi Bridges, Teri Anderson, Joy Taylor and Julie Ebersole! So, remember a couple of posts back I said I wanted to show you my original intent with our No Peeking stamp set? Well, I finally got around to it! I'm a big, big fan of kraft wrapping paper and then dressing it up with something cute and festive. I thought how cool and convenient would it be to stamp directly on the kraft wrapping paper? 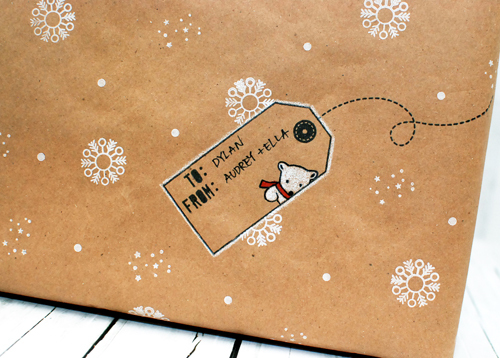 You can make your own custom wrapping paper with any stamps you have in your stash, but let's take it a step further and finish it off with a tag complete with a faux hanging string. Here's a closer look at the stamping. I colored the polar bear in with white colored pencils. I also outlined the perimeter of the tag with the white colored pencil. It helped give the tag some pop and definition. The red scarf was colored with a Copic marker. I created the tag and snowflakes with No Peeking. The small round dot is from Cup of Wishes and the little star/snow confetti is from Believe in Magic. I really love that little stamp! Okay, you ready to stampede along? We're giving away a gift certificate to our store to one person - so make sure you leave some love on everyone's blogs to increase your chances! The winner will be announced right here on December 5th. Here's the list of designers and their blogs, now off you go! PS: Have you 'liked' us on Facebook yet? There may or may not be some exciting news coming soon, so stay updated by connecting with us! LOVE the stamped kraft wraping paper! what great stamped wrapping paper and the little tag right there is perfect. Perfect wrapping! Love that adorable tag!! love all the stamp sets!! Pretty wrapping paper! What a great idea! That little peaking bear is ADORABLE!!! I'm with you! White on Kraft is wonderful and I just love that you stamped the tag right on the paper!!!! What fun stamps and a great wrapping for someone! TFS! Love this idea! And your gift wrapper is super cute! Awesome idea to stamp the tag right on the kraft paper. I like the white highlights. This is sooooooo cute! What a fun idea! Such a great idea for using those tag stamps =) TFS! Love how this turned out. So sweet! Can't wait to see all the projects! I love your stamps, and how cool to see the tag as you'd envisioned it!! I loved all the inspiration on the blog hop! Love all your stamps! The blog hop was fun! OH MY! This is just adorable! I love the kraft wrapping paper with the white stamping! FAB FAB FAB! Awesome wrapping paper. And the bloghop was terrific. This stamp set is wonderful. This is so cute and I am growing so fond of kraft wrapping as well! Thanks so much for the inspiration! Off to go hop! Love the little polar bear! Super cute!! So cute. Love the gift wrapping. What a fabulous idea to add the tag to the wrap like that. LOVE white stamping on kraft! What a krafty idea! Love your wrapping paper, it is so cute. The tag is too. Love the white stamping on craft paper, super cute. Love the tag in the wrapping, no extra layers! Your design team had some SUPER holiday projects! LOVED all the whimsy! What an adorable gift wrap idea and my favorite part? The faux hanging string! So cute! 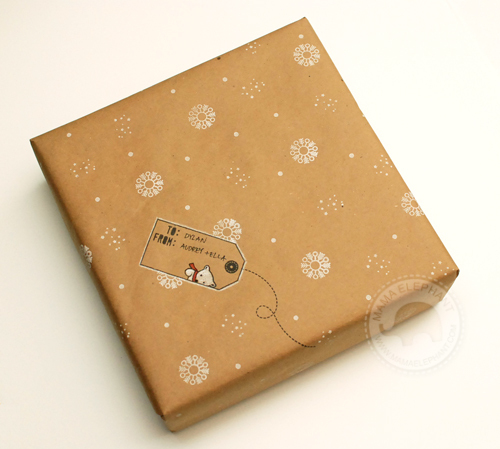 Love this make your own gift wrap and the no peeking set is perfect for tags.